Call it a red beer, or a red-eye, or a tomato beer, just don't call it a Bloody Mary. 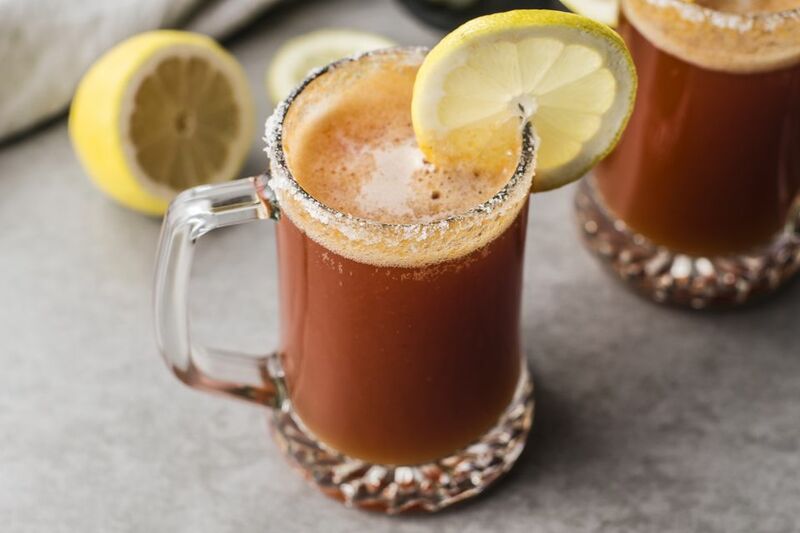 This is a very simple beer drink and although it's similar to a Bloody Mary, and some people mistakenly call it that, it is clearly not. The Bloody Mary has a vodka base while the beer is used to mix up the red-eye. The recipe is also much simpler and really could not get much easier. To make it, you'll simply top your beer with a little tomato juice and add a pinch of salt. This is a great drink for brunch and you'll find it perfect for watching your favorite college team play a mid-morning game. The red beer also is a super-easy "hair of the dog" option for those morning hangovers. That is, of course, if you have beer left over from the party. Pour the tomato juice into a beer mug. The Beer: Any beer can be used in the red eye, although you will find light lagers work best. There's no need to pour your good beer into this drink, so save the IPAs, stouts, and ales for drinking on their own. Spice It Up: You also can dress up this drink's flavor in the same way you would a Bloody Mary. If you happen to have ​a Bloody Mary mix in the refrigerator, go ahead and use that. Everything you need is right there and you'll get a very flavorful drink. Should you opt for the straight pour of tomato juice, don't skip the salt. It marries the two flavors together, which is why bartenders will often give you a salt shaker when you order a red beer. Just a pinch will do and be sure not to overdo it because it can quickly become too salty. If you like, add a dash of hot sauce, a grind of pepper, or a pinch of celery salt to the mix. Be sure to go slow, stir the drink, and give it a taste before adding anything else. After a red beer or two, you'll find the perfect combination of your personal taste. How Strong Is the Red Beer? Depending on how you build it, the Bloody Mary often weighs in somewhere around 10 percent ABV (20 proof). It's a relatively light cocktail, which is why it's long been a morning favorite. Even though we're pouring more beer into the red eye, the absence of liquor makes this a considerably weaker drink. If you begin with a 5.0 percent ABV beer, the finished red-eye will be brought down to a mere 4.2 percent ABV.